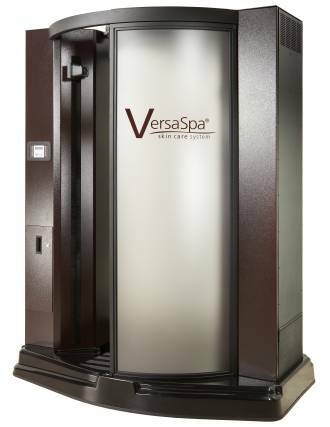 Our VersaSpa is simply the world’s most advanced sunless tanning booth. It produces a completely natural tan that is impossible to tell apart from a normal UV based tan (sun or sunbed). It’s quick and completely private. In just four minutes you’ll have beautiful tan and can get dressed immediately. Unlike traditional spraytans the VersaSpa uses three different solutions to give you a long lasting and natural tan. You don’t need to pay $60+ to stand naked in front of a stranger. Starting from less than $30 you can get a perfect tan in the complete privacy of our VersaSpa. Step one – preparation spray. The prep spray balances the pH of your skin to help the tanning solution adhere to your skin. It also disperses the natural oil in your skin to ensure an even coverage. Step two – tanning spray. This consists of two different types of sugar that react with protein in your dead skin layer to produce the tan. It also has a bronzer tint added to give an immediate tan that will wash off when you next shower. Your tan will take 12 hours to fully develop and you should avoid showering for at least four hours. Step three – anti-aging and skin firming spray. Designed to hydrate and firm the skin. This spray will seal and mask the smell of the tanning solution (it’s not unpleasant, but it’s not perfume either). The VersaSpa has no doors thanks to the EZ-2Breathe ventilation system, so no claustrophobia. It also has an infrared heater and spray nozzles that also function as blow dryers ensuring you are dry at the end of your session. With the VersaSpa’s voice automation system you’re guided each step of the way with clear instructions throughout your session.